2006-2010: B.Tech. in Electronics and Communication (Gautam Buddha Technical University). July, 2013-August, 2014: Assistant Professor in Chandigarh University, Mohali. Recipient of GATE Scholarship during M.Tech. Qualify CSIR-UGC- NET in year 2013. 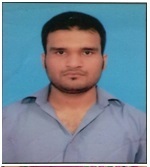 Prashant Bhardwaj, Jaspal Singh, “Design and Development of Secure Navigation System for Visually Impaired People”, International Journal of Computer Science & Information Technology (IJCSIT) Vol 5, No 4, 2013(Impact Factor: 2.93).